Going to a clinic with a new instructor is for me always fraught with some nerves and excitement. I’m excited to have the opportunity to learn, but nervous that I will not understand them, be too slow/stupid/uncoordinated/annoying for them, and that they will yell at me and I will cry. Yes, ridiculous, I know. But these are the things I worry about some times. Among many other things that I won’t go into today. However, Finn and I are in the midst of a three day dressage clinic, and after Day One, I’m delighted and having a great time! I thought it would be useful to share a couple of things I’ve learned so far with a few screen caps from the video my husband took. Of course there are many not so pretty moments, but I have editorial license to leave most of those out :-). 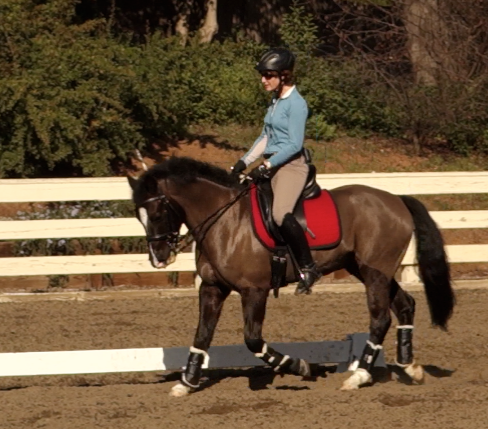 Our first ride was great and I loved how my horse felt (and I so appreciate how good he is in new venues). He was cooperative, forward, and we were able to do most of the things the clinician asked us to do – not always perfectly, of course, but we felt like we made progress as the lesson progressed. But when I watched the video, I, my own worst critic, cringed at first. Who is the horrible sack of potatoes bouncing on top of Finn? I had no idea I bounced THAT much at the sitting trot. 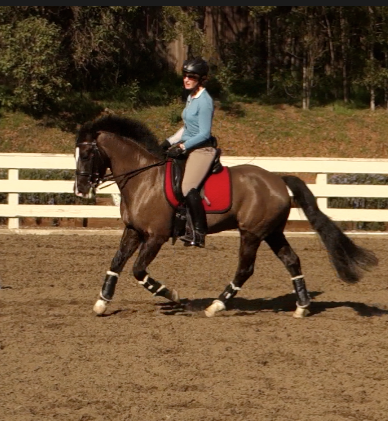 Finn does have a very springy trot (unfortunately), and I’ve worked very hard to learn to sit it. I just thought I was further along and was rather horrified to see it was pretty ugly at times. Poor Finn, he’s very tolerant of me, but he deserves someone who can sit his trot. Sigh. Still working on it. See that braced position with heels up? Yuck. Working on eradicating that from my life. Her insistence that I drape my leg, allowing it to relax and hang, and get it away from his sides, balancing on my seat bones and allowing my seat to rest on his back…made a HUGE difference. Finn went more smoothly, I sat more elegantly (I felt it, and the video showed it), my hands became more steady, our connection became better, and EVERYTHING was better. 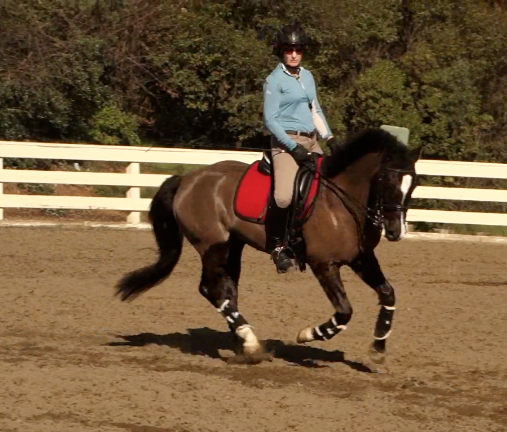 When I bend my knees and bring my heel up (as in the picture above), it pops my seat out of the saddle and I bounce. Yep. So, lengthening my leg and using my seat rather than my leg for most aids allows me to sit even a BOUNCY trot. Yahoo! Now I just have to be consistent about this, because Finn is very happy to lure me back into doing all the work…More clinic reporting after the next Two Days. I can’t wait to see what Finn and I learn next! And how we perfect the draped, relaxed leg, and the “go from the seat and stay in front of the leg” feeling! More canter! Go Finn, from the haunches! I should be looking more straight ahead, not to the side, even though we were on a 20 meter circle.